Lion is fed up with the city and moves to a desert island, just him and his trusty guitar. But he soon starts feeling lonely and sends out a message in a bottle, looking for a friend – one friend – to strum guitar with. No one comes, so Lion sends out more and more bottles. Suddenly, animals of all shapes and sizes start arriving from around the world. There are lots of them… and none of them brings a guitar. Will Lion open his home and heart to the new arrivals? 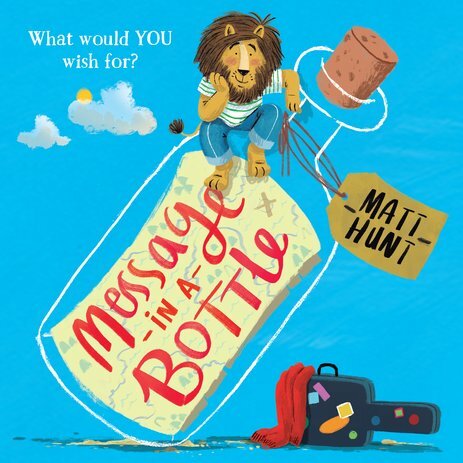 A stunning, topical picture book from an exciting new talent, Matt Hunt. This is a big paperback, with squared pages. The pictures are very very cute and not frightening, even if you can see grumpy&serious tigers, crocodiles and gorillas. (there’s even a penguin, a rhino and a flamingo but they’re happy). The story is nice, and the words used by Matt Hunt are simple yet funny. A Lion gets fed up with the city and bad weather, so he moves to a desert island with his guitar and strawberry smoothies. No one can bother him there. He plays with his guitar and beach ball, wash the dishes…and gets bored. When he starts feeling lonely, he sends out (you guessed) a message in a bottle looking for a friend to play with. Then, he sends out a looooot of bottles and, all of a sudden, everyone come to the island. If at the beginning Lion isn’t so happy about the results, then he starts to love the music all these different animals makes together, and he joins the jam session, finally happy. The read out loud is nice, but I can’t believe someone would leave for a desert island without bringing a book, or trying to explore around. It’s a story a bit too simplistic. I shouldn’t ask much to a picture book for children, but the lack of books really a pet peeve for me. I got that the story has a sort of moral about embracing and tolerate the others/the difficulties/stuff we don’t like, but still.